These are pretty dull times down at Upton Park as we stumble home after a Premiership season that promised soooo much but drivelled out into nothing of consequence. Not surprisingly, many fans have let their boredom get the better of them - with reports of a massive increase in presentations to Basildon University hospital with gardening and DIY-related injuries. 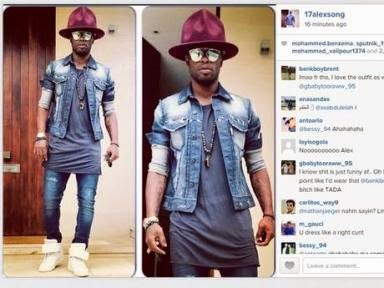 Now it seems that the pointlessness of our season has gotten to the players, with Alex Song resorting to dressing like a plonker just to amuse and titillate the suicidally bored fans. Sadly for Song, the fashion police have decided that his latest 'outfit' is a style-atrocity too far and duly arrested him earlier today. Is there no end to what our modestly reimbursed staff will do to enhance our Hammers experience?